As part of Office 2011, Microsoft has released new versions of its home and corporate instant messaging (IM) applications: Messenger and Communicator. Messenger is the home/SOHO/I-don’t-have-Microsoft-Lync/Office-Communications-Server-(OCS) IM application. It offers some improvements over previous versions, such as animated emoticons (evidently very important to some people), video and audio chat features. The user interface is fairly clean. It doesn’t crash, at least not in my use. Messenger is, well, functional. It integrates nicely with Office's presence-awareness functionality. (You can see who among your Messenger contacts are online from within other Office programs.) Conversely, if you don’t have a Messenger or Communicator account, you get none of that functionality; it’s Communicator, Messenger, or nothing. The problem is, unless you have business contacts, co-workers, or friends who use Messenger and nothing else, there’s not much reason to use or even install it. Compared to iChat—the standard for instant-messaging on the Mac—Messenger's only advantage is that it lets you talk to other Messenger users. Its list of disadvantages is long. Do you have multiple accounts you’d like to monitor at the same time? You can't with Messenger. You can change the account you're monitoring, but you can’t have multiple accounts active at the same time. File transfers are annoying: In iChat, dropping a file into the chat window only stages the file transfer; in Messenger, once you drop the file, you’re sending. While iChat has a solid set of A/V preferences—you can choose your audio source, set up Bluetooth headsets, set bandwidth limits, make sure your video source is working before you try a call, check your audio levels, test your connection, and selectively enable audio or video—Messenger doesn't have many at all: you can start an audio only call, an audio/video call, and that’s it. You can’t do one-way video chats either—at least, not on purpose. In my testing, getting two-way video to work was spotty. Sometimes it worked, sometimes not, but there was no way to see what was going on. This usually led to accidental one-way chats. Unlike iChat, which has an extensive AppleScript dictionary that not only allows you to customize program behavior, but automate message replies, sends, and file transfers, Messenger has just enough AppleScript support to let you start and quit the application. Clean UI: Messenger works well enough, but has many limits that won't make you switch from your current IM client. Do you want to talk to someone not using the Messenger protocol? Good luck. Unlike iChat’s support for AOL Instant Messenger, (AIM) and Jabber, an open IM protocol used by companies such as Apple and Cisco, Messenger supports Messenger, and that’s it. You can use Bonjour to talk to other Messenger users on the same network, so that’s handy. The lack of multiprotocol/multiple account support is particular annoying for someone like me, who, for work alone has three IM accounts. I could not imagine trying to get this to work with Messenger. There is also one behavior of Messenger that is just puzzling, and that’s the way it quits. It's a multi-stage process, in which the program closes chat windows, then logs out of the Messenger service. It then sits there for a second and finally closes the remaining window, and goes away. The first time this happened, I wasn’t sure I’d quit correctly. After a few seconds, I realized I had and that this is just how Messenger works. I appreciate the feedback that process allows. But generally, when I quit an application, I’m more impressed by the speed of said quitting than by notifications of same. Communicator, the corporate version of Messenger, is an easier sell. Since you have to be part of a network using OCS/Lync to even use Communicator, it’s a good bet that you’ll have some work-related reason to use it. Via OCS/Lync, Communicator gains a lot of features that make it far more of a useful application than Messenger; Communicator can handle everything from basic IM to telephony needs. 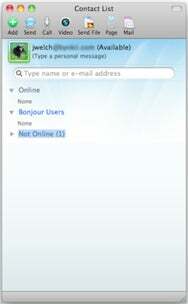 Since OCS/Lync can act as a gateway to other IM services, OCS/Lync allows Communicator users to easily communicate with people using Windows Live Chat, AOL, Yahoo, and Jabber, (which adds in Google and Facebook.) Thanks to OCS/Lync, a company can also federate their services with those of another company running OCS/Lync, making for easier contact list sharing, A/V conferencing, what have you. It’s not that Communicator is that much better than Messenger. But by hooking Communicator into OCS/Lync, and the services those servers provide, Communicator becomes a useful addition to Macs in a Microsoft-based corporate environment. Of course, if your environment is not based around Active Directory, Exchange, and OCS/Lync, Communicator will do you no good. If you’ve the right environment, Communicator is useful across a far broader range of needs than Messenger. Since Messenger comes free with Office or as a free download, there’s no real risk involved. If you find a need for it, you come out ahead. If not, you’re only out a bit of time and disk space, and you can get the latter back. But if you don’t have Messenger-specific needs, there’s little reason to use the application. Like Messenger, Communicator is not a product you purchase per se. Instead, you'd acquire it through the corporate licensing options that come with Microsoft OCS/Lync; the requirements for using it ensure you’ll actually need it. Coupled with the features available through OCS/Lync, Communicator is a far better product than Messenger.